New Real Madrid head coach Julen Lopetegui. Spain could hardly have wished for a bigger distraction to their World Cup preparations, but Rubiales wasn’t pleased with how Real and Lopetegui conducted business behind the Federation’s back. Hierro will be under immense pressure to get the squad focused for their difficult opening game against European Champions Portugal. Brazil and Germany are pre-tournament favourites, but Spain were expected to do well under Lopetegui. The 51-year-old has been active since 2008 and has enjoyed successful stints in charge with every side he’s managed. Spanish football expert Guillem Balague believes Hierro can steady the ship in Lopetegui’s absence. He said: “Fernando Hierro was absolutely crucial at the 2010 World Cup when Spain lost to Switzerland in their first game. He was director of football at the federation and was the calm force of that camp. 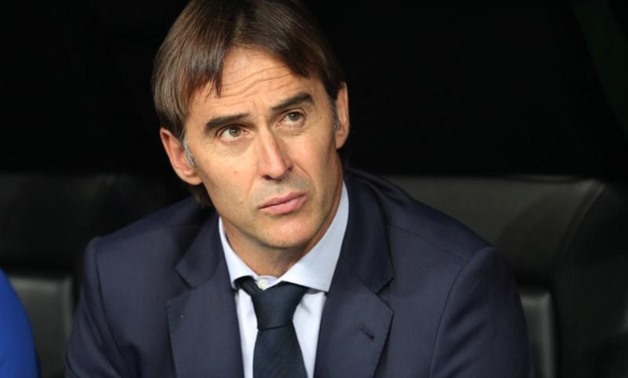 Now, Lopetegui will turn his attentions to Real Madrid and can get started earlier than he expected this summer. Los Blancos finished in La Liga last season, behind champions Barcelona and runners-up Atletico Madrid, while bowing out of the Copa Del Rey to Leganes at the quarter-final stage. Real sealed their third consecutive Champions League trophy in May which helped to gloss over a lot of failures from last season, but the 51-year-old has a task on his hands to turn things around quickly at the Santiago Bernabéu.